Filestream is a cool feature, albeit one that’s cumbersome to use in SQL Server 2008 and R2. However the FileTable feature in SQL Server 2012 builds on Filestream and you must enable this feature for FileTable to work. There is a good document in BOL about this. It basically has you doing a few different things. 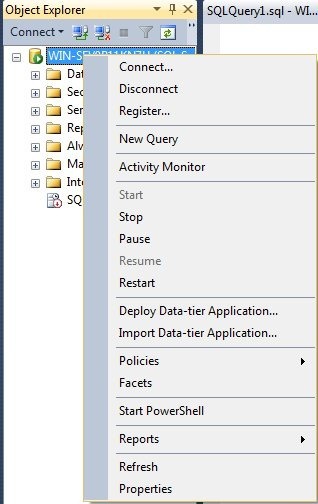 The first step is to enable the filestream access from outside SQL Server using the SQL Server Configuration Manager. When you start the manager, right click the database service and select properties. The database engine has to allow for the access to the file system, so this allows that integration. Typically a Windows administrator is required to dot his. Once that is complete, you will see the account properties for the service. What we want to do is change to the FILESTREAM tab, shown on the bottom row to the right. 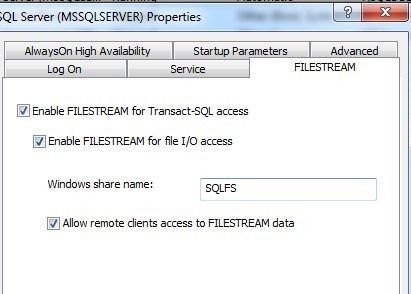 On this tab, we can enable Filestream only for SQL Server, for I/O access as well, and specify a share. For Filetable we need to enable both levels of access and create a share name. I chose “SQLFS” for my share name. Once this is done, you need to switch to Management Studio and then right clicking the instance and selecting properties. This will bring up a series of selections. If you choose the “Advanced” item on the left, you will get a list of properties for the instance. Near the top, there is the FILESTREAM section. Below I have dropped down the choices. By default, this is disabled, and for FILESTREAM you can select either of the other options, but FileTable needs the full access. Once this is done, you need to restart the instance to enable the Filestream for the SQL Server. This doesn’t set up FILESTREAM in any of your databases; this merely enables it for the instance. You need to still create the FILESTREAM filegroups in any database that will use FILESTREAM data. This entry was posted in Blog and tagged Filestream, sql server, syndicated. Bookmark the permalink.